After the speeches and glad-handing at the Professors Emeritus Banquet," a student bartender, opened the first bottle of champagne with a loud "POP." Everyone laughed as the cork flew upward to pass over a gymnasium rafter. "Honey, is a brick falling off that truck?" Is there any chance the brick might bounce over Dad's Mercedes? Two boys struggled to move a tractor tire from flat on the floor to a position leaning against a wall. The sketch shows the tire initially 1) and finally 2). What "least" work did the boys do? Consider a block of mass 6 kilograms. The block was first observed moving down a frictionless plane with a kinetic energy of 19,200 Joules, State (1). We set the time (the moment of first observation) to be, t = 0+. The coordinate "S," is added to denote distance down the plane. A hockey player received the puck and checked it. Then with a quick (approximately 25 centimeter) sweep of his stick, he slapped the puck across ice into the net. Our system, is the 0.2 kilogram puck received with low speed. Our event is its "slap" to goal, delivered at 30 meters per second. Calculate the Work of the shot. At sea in a small boat during a storm, a man operates a manual bilge pump. t. Raised by hand, the piston lifts water from the bilge of the boat and dumps it into the bay. Given the information provided by the sketch. Calculate the least (theoretical) work of the man per stroke of the pump. The sketch depicts a buoy floating in the sea. A cable is lowered from a dock and attached to the buoy (1). The event is that by the cable, the buoy is hauled to a second state, (2). Calculate the least work required of the cable that lifts the buoy. The sketch, (1) shows a buoy floating in the sea. A cable lowered from a dock is attached to the buoy and the buoy is hauled to state (2). Take the system to be the buoy, a short length of the cable and part of the sea. The cable moves the buoy for condition (1) to condition (2) as shown. Calculate the least work required of the cable. A tank contains a shallow body of water. Its bottom, left wall, and ends are fixed. The right wall can be pushed to the left and will remain vertical should that happen. Seals prevent all leakage of water. Figure 1. shows the wall in its initial and final positions. Derive an algebraic expression for the "Least Work" required of the worker to push the wall a distance, L, to the left. To observe nesting eagles, naturalists built a blind. With a cross-bow, a line was passed through the canopy of a neighboring tree. Next a block and tackle (a "gun tackle" shown below) was hoisted and manipulated to attach to a secure limb. First Lift: The woman got into the harness and the man hauled rope to lift her (mg = 500 N) to the tree top. 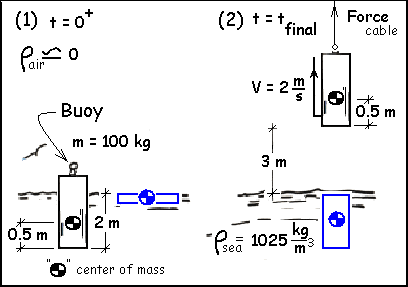 Calculate the work by integration of hauling force applied to the rope times its displacement. Next calculate the same work by use of the energy equation. The Bulgarian, Ivan Charakov, is shown in the "squat stage" of a competition lift. Once he adjusts his stance, he will extend his legs to raise the weight to his full height. Analysis using principles of physics make reality more understandable. Stated briefly, analysis addresses three physical properties: mass, momentum and energy. Consider a rock climber (50 kilograms) who climbs to the summit of a popular practice-level rock formation. The increase of elevation of the climber is 80 meters. Typically, persons would view this task or event at one that involves work. In the common meaning of the word, it does involve "effort" or work. First apply Newton's 2nd Law, then apply the principles of thermodynamics. Calculate the work of the climber. Our system is the simple span of a drawbridge. To "select the bridge as system," is to isolate it. To do this, let your mind trace the entirety of the boundary of bridge. The event for the bridge will be that the "drawing ropes" pulling it from its horizontal to its vertical position. What least work is required to raise the span? An elephant and her mahut can weigh a teak log. The mahut shows the elephant a piece of chalk then points to a teak log; the elephant knows what to do. With its trunk and tusks the elephant lifts the log slowly and carefully to a balanced, level position, pauses, then puts the log down. The mahut marks the balance point of the log as his helper climbs onto one end. The elephant is shown the chalk again. It lifts and balances the log a second time with the helper standing on one end, grasping the elephant's ear for balance. 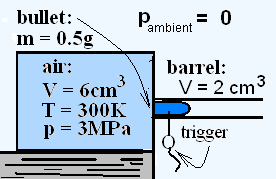 The mahut uses this information to estimate the weight of the log. An airliner of mass 300 tons is powered by four engines each of which develops a steady power of 15,000 kW. The take-off speed of the aircraft 75 m/s. The aircraft requires 11 minutes to attain its cruising speed of 210 m/s at an altitude of 10,000 meters. Calculate the work of the aircraft expended to overcome the air resistance, or drag, it experiences for the duration of the climb. Basic mechanics can be used with the energy equation to evaluate the efficacies of work tasks. Consider the manners by which each of two workers moves a BOX (m = 12kg) from the storage floor to the tailgate of a truck. Use the data of the figures. Calculate the energy expended (J), and the average power (W) for the moving events of A and B as described below. This concerns the simple task of pushing a crate slowly up a plane inclined at 45 degrees. 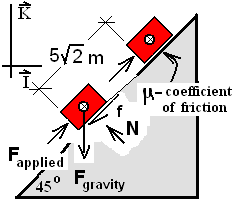 The surface opposes the motion; it has a coefficient of friction, μ. The simple geometry permits both the energy change and work of the event to be calculated then compared. Note: Earth and the Block are taken as system. Calculate the energy change of the crate. A force is applied to move a heavy crate across a horizontal surface. The coefficient of friction of the crate and surface is 0.3 (μ = 0.3). The crate is modeled as an extended body. The sketch shows its free-body-diagram and the orientation of the applied force. The event is that the crate is pushed a distance, L, to the right. a) Obtain a general expression for the least magnitude of the applied force required, as a function of the angle of application of that force, θ.
c) Calculate the least force required to accomplish the event and the least work. At youth fairs across the State, Law Enforcement Agencies simulate the aftermath a head-on collision for all to see. 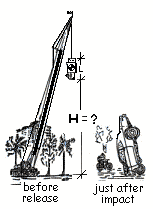 A crane hoists the hulk of an automobile so high that when it is dropped, the car impacts solid concrete at 70 miles per hour. On Feb 18, 1885, a train engine moving at high speed collided with a second, stationary engine. Their engines were identical, having been manufactured by the same company. The aftermath of the collision was engine A (stationary upon impact) situated near vertically on top of engine B. The apparatus mixes the ingredients of a polymer that is used to seal and fire-proof the interiors of aircraft fuel tanks. Ingredients are poured in from the top which remains open to the atmosphere. 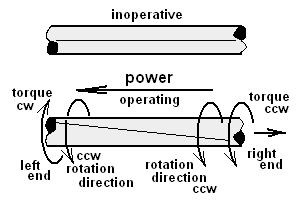 The stirring propeller rotates at 60 rpm, driven by the motor below. The table contains information regarding the event. Apply the energy equation. What does it tell us? Men hunt monkeys and birds in the Amazon forest using long wooden tubes called blowguns. A monkey in sight, the hunter slips a poisoned dart into the tube and quietly lifts it to vertical. Taking a deep breath and a steady aim, he contracts his chest to blow the dart skyward. When successful, the dart hits a monkey and it falls to the ground. The image shows geometry of a hunt. Calculate the least muzzle velocity of the dart. A standard feat of skate board competitions is "get air" which means simply to "jump" in which the skater starts by tipping into the ramp (1), gaining momentum with the fall then "getting air" or height on the opposite side (2). Skate boarders know "Air is not for free." What must a skate boarder "pay" to attain one meter of air (height)? In 1860, Alfred E. Newman patented this clever device to annihilate bugs that might hide on the ceiling. Al and I bought one. Be quiet, we are are about to demolish our first fly. It is sitting on our bathroom ceiling. By forklift, we quietly positioned the annihilator to enclose the fly. I'm a little nervous, we are standing under a very large piston. Al claims this tested just fine on a pesky raccoon. Two children sit in a porch swing which is initially restrained from motion by a rope, 1). When child B releases the rope, the two swing through air until the swing and boys cease to move. The final, at rest angle (θfin), defines the final condition of the system, 2). Calculate the final angle the swing will attain. Science students are physically aware of temperature and the associated event, heat. When heat and temperature are being considered, the model BODY or point mass is inadequate. The model required is pure substance or material (metal, solid and so). In addition a new energy form is needed: internal energy. A great­ly simplified sketch depicts a loaded "air pistol." The chamber of the pistol contains air compressed to 3 MPa. The "trigger" is a pin that constrains the bullet in the barrel. When the pin is pulled, the bullet is released and the compressed air expands to expel it from the barrel into the surrounding atmosphere. Use the data of the sketch. Calculate the theoretially maximum velocity the bullet might attain. It is proposed to construct a mortar to shoot water vertically. It is intended that water be the "projectile." The air compressed beneath the piston will be the "propellant." 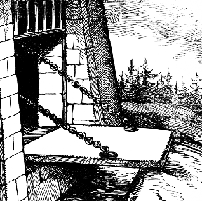 The figure shows the steps to "load" the mortar. We will Analyze the "loading" and subsequent of "firing" of the motar. Initially the temperature of the everything is uniformly 300 K and the water in the stand-pipe resides at (1). The spring is compressed, it holds the frictionless piston to the left. At time, t = 0+, the heater is turned on. It deliver 6 kilowatts of thermal energy to the air. 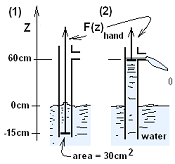 The final state occurs when the water level in the stand-pipe is 8 meters higher. At what time is State (2) attained? The event of this dis­cussion is an "idealized heating" of an ideal gas inside an "idealized piston/cylinder" assembly. You must believe in make-believe! The theoretical, frictionless apparatus assures a constant pressure process of the ideal gas. Conditions of the figure correspond to the instant the candle is lighted. 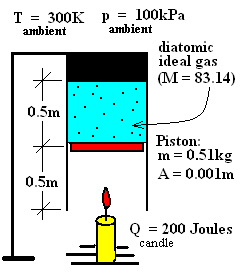 When the candle has burned completely it will have provided 200 Joules of heat to the diatomic ideal gas (M = 83.14) contained. As a driver in a car traveling at 60 km/hr approaches an intersection, the light suddenly changes. The driver applies the breaks until the car stop. If the vehicle (plus driver) mass is 1075 kilograms and the deceleration is constant over the 5 seconds of stopping, calculate the average force that acts at the points of tire-to-road contact. To place scientific packages into Earth orbit is expensive. A great part of the cost is the fuel consumed with lift-off. The schematic shows a system proposed as the first, lift-off stage. Setup: The tall circular launch tube is a shaft that extends downward into a large mine with numerous accesses. 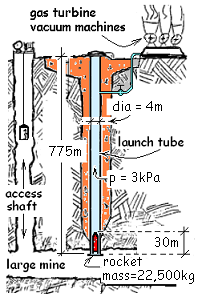 The rocket, positioned in the tube snugly, is supported at the bottom of the shaft. A strong, deployable hatch covers the top of the shaft and beneath the rocket, sealing the shaft below, is an explosively destructible shield. 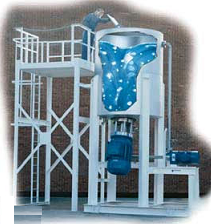 Prior to a launch, vacuum machines slowly and economically extract air from the shaft until a pressure of 3 kPa is attained. The design and setup of bungee jumping ropes is a matter of "life or death." When done wrong, we read about it in the newspapers. The rail of the New River Gorge Bridge passes 785 feet above the surface of the slow, trickling stream, the New River. Our jumper, a 120 pound "living-dangerous" lady, wants the ropes set so at the bottom of her jump she can grab a fistful of water from the river. 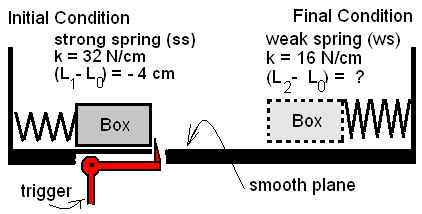 The sketch (left part) shows a box shoved against the strong spring compressing it 4 centimeters and restrained there by a "trigger" mechanism. When the trigger (our catalyst) is pulled the box is projected to slide across the "assumed smooth" plane, ultimately to encounter the weaker spring and compress it. 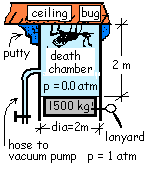 ♦ Calculate the "shut-off" depth of water in the washer. An elevator operates by cables, pulleys, an electric motor and controls. This elevator is driven by an 8-kW motor. Assume the elevator operates with no power lost to friction. Calculate the maximum rate of ascent of the elevator. The marine turbine of a destroyer produces 5000 horsepower while rotating 25 thousand revolutions per minute (rpm). But the ship propellers work best while rotating as 180 rpm. Were the gear to operate ideally, what would be the output torque? In many countries, oxen, guided by children, plow straight, level furrows through soil. The ox of the figure pulls its plow a length of 200 meters in five minutes. Calculate the least average horsepower expended by the ox. The power, or energy rate, of a truck varies considerably with its motion through the gears, speeds and such. Suppose in normal operation a truck loaded to 80,000 pounds moved horizontally from stop to a speed of 40 miles per hour in a distance of about 1/4 mile. Use the definition that “truck horsepower” is the time-average change of kinetic and potential energy of the truck in its event. What average horsepower is required by the truck to accomplish this event? The system of this discussion is a typical military tank that moves only in the horizontal. The perspective of discussion is the energy equation, rate form, (potential energy omitted ~ horizontal motion). The events of a bicycle race are explained simplistically as "the cyclist expends physical (metabolic) energy to move himself/herself and the cycle along a road and through the surrounding air. In places the road is flat and further along there are hills that must be climbed. Descents from hilltops are the easiest events of a cyclist's race. 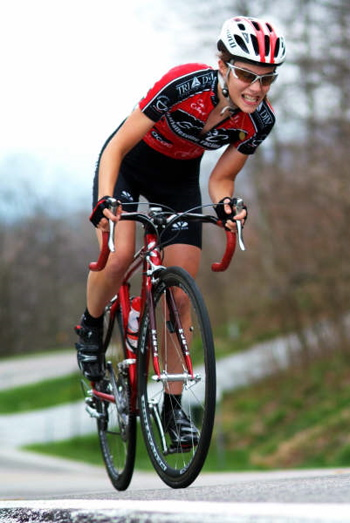 Racers describe their racing as having three types: time trial, climbing, and downhill. In this example we compare the three phases at those times, at instances for which speed of the cyclist/cycle system is constant. A car that weighs of 3000 N has been tested thoroughly. Under full power its engine produces 160 kW of power (in excess of internal losses, rolling friction and other losses). Traveling at top speed on a level road its maximum speed is 35 m/s. Suppose the car were to travel up a hill with a rise of 1 meter for every 20 meters traveled. What constant speed would be expected? The event of "braking" of an 18-Wheeler falls in the category "energy is conserved" (at least temporarily). When the fast-moving truck brakes, its kinetic energy transforms into increased internal energy of the truck. This energy resides principally and momentarily, in the brake shoes and drums. By basic physics we know increased internal energy of a solid is exhibited by its increase of temperature. In this example, we stop a big truck safely so the brakes get hot but are not ruined. 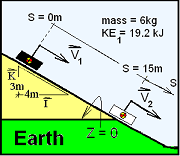 In the time of Newton accurate determination of the surface acceleration of gravity was difficult. Some forty years later, the Reverend George Atwood devised (and built) a quite clever apparatus to measure that acceleration. So successful was his device that thereafter all devices developed to measure Earth's acceleration of gravity were named, in his honor, "Atwood Machines." ... ordered massive tracts of land along the banks of the Yellow River to be cleared of trees and turned to agriculture. But snow and rain flowed from the mountains across the treeless banks and stripped fertile soil into Yellow River, whereupon it was carried all the way to the Yantze to contribute to severe flooding. Next, to control the flooding, Mao had his people build large dikes along the Yantze - by hand. 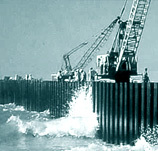 Sheet piling are used to construct temporary barriers in waterways to put in bridge footers, lay fuel lines and such. Once placed, the longer those piles remain (especially in salt water), the greater the headache they are to remove. Worth salvage, the embedded piles must come out, one at a time with their connecting edges intact. By watching a load gage mounted on the drag-line boom, experienced operators can decide when salvage is worth the wear that removing them will put on the lifting machine. Sometimes the piles are pulled and scrapped.